A cumulative record of public and academic library buildings, built, extended or refurbished since Designing Libraries began collecting data in 2004. A schedule of new and refurbished public library buildings in England since 2011. Last updated 31 May 2018. The record dates back retrospectively to 1990. The data are compiled from information submitted by individual public library authorities and academic institutions. Not all entries are complete because the information submitted was not complete. The record is representative and not exhaustive and therefore does not fully reflect the number and extent of new or refurbished libraries across each sector and within the UK and Ireland. There are currently more than 550 individual records in the database. Designing Libraries continues to accept new entries, revised data and entries that fill gaps in the record. 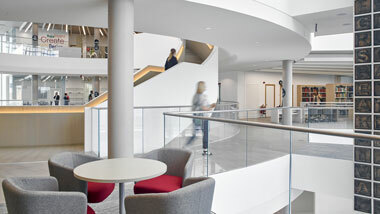 In addition to the database records submitted by participating libraries, Designing Libraries also separately maintains a record of announcements of new, refurbished or relocated public libraries in England, from 2011 to date, derived mainly from local press reports. A spreadsheet of data by authority and links to their sources can be viewed by downloading the document from the link on the right. The data sheet also identifies which libraries are co-located with other services or leisure/cultural facilities.